Hi. I'm planning on controlling a Leaf inverter on my own, with none of the rest of a Leaf at my disposal. I've done some reading and it appears the inverter is able to store DTCs and go in a permanent low power mode according to the stored DTCs. It seems I cannot clear inverter DTCs using LeafSpy because if it was able to clear them, it would do it through the VCM. I don't have a VCM. Does anyone have a capture of the EV CAN bus when inverter DTCs are being cleared, or does anyone have the resources to do one for me? E.g. 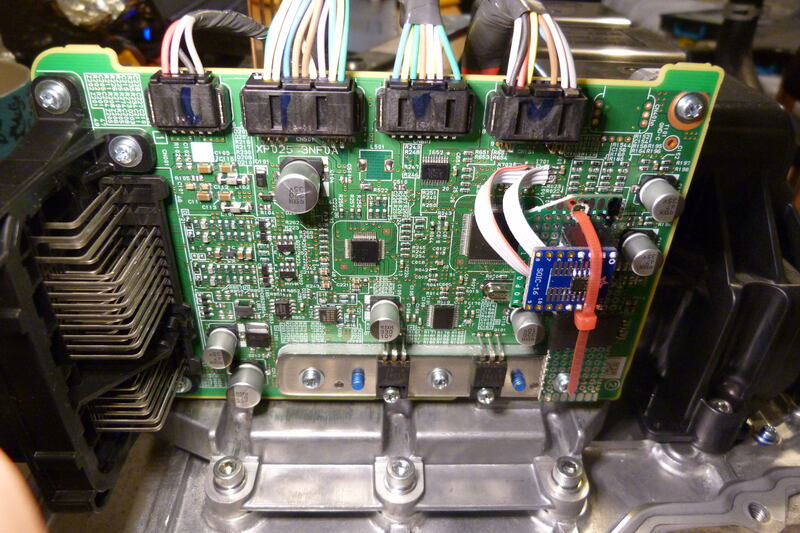 unplug the motor sensor wire to get some DTCs and then capture the reading and clearing of them. celeron55 wrote: Hi. I'm planning on controlling a Leaf inverter on my own, with none of the rest of a Leaf at my disposal. To clear DTCs from a standalone motor/inverter unit you would need a new version of LeafSpy Pro that skips trying to read information from all the other ECUs. This was done to support clearing BMS DTCs from a standalone battery pack. I can look into adding that on a future update I am working on for another person. You would then go into Settings and change the Model year to Motor/Inverter. Turbo3 wrote: I can look into adding that on a future update I am working on for another person. You would then go into Settings and change the Model year to Motor/Inverter. I imagine then I'd just connect the EV CAN bus to the regular CAN pins of an ELM327, fiddle with some settings and be on my way? Any estimate on when this feature would be available? Working on it right now. Probably a couple of days. Update done. Version 0.40.107, which I will release shortly, now supports a Motor/Inverter only mode. Just go into Settings and select the top most item for Model Year ("MTR/INV"). Can you take a screenshot of all the DTCs before you clear them? Whose large processor is located near the serial EEPROM you removed, i.e. the one most likely doing system diagnostics? Surely that processor has flash, but having an external EEPROM possibly simplifies external access for diagnostic tools. lorenfb wrote: Whose large processor is located near the serial EEPROM you removed, i.e. the one most likely doing system diagnostics? The board has two Renesas MCUs: R5F71476FPV (the big 32-bit one) and R5F2120 (a 16-bit one on the backside). Neither has internal EEPROM, and usually you don't store anything in flash when you have an external EEPROM at your disposal. I'm currently basing my work on a gen1 capture, which is not ideal at all. on-board flash. That serial memory was mostly used to store a rolling remote key code for the main ECM processor's immobilizer function. As far as I know, Bosch doesn't make anything in the leaf. The main ECU is made by Hitachi. TCU is by Continental. My guess is the inverter is designed by Nissan in house.